Planning for functional outdoor living space is an exterior design essential. Successful AEC professionals can surpass average architectural home designs and create exceptional residential spaces that deliver real value to customers. When you are finished reading this article, earn 1.0 AIA Learning Credits by taking the corresponding continuing education course. The most logical way for AEC professionals to achieve success with exceptional residential spaces is to first take a look at the most in-demand trends and what makes them popular. Then, to position themselves as knowledgeable professionals in the trends they want to explore. And finally, to specify the best building products to achieve the desired results. 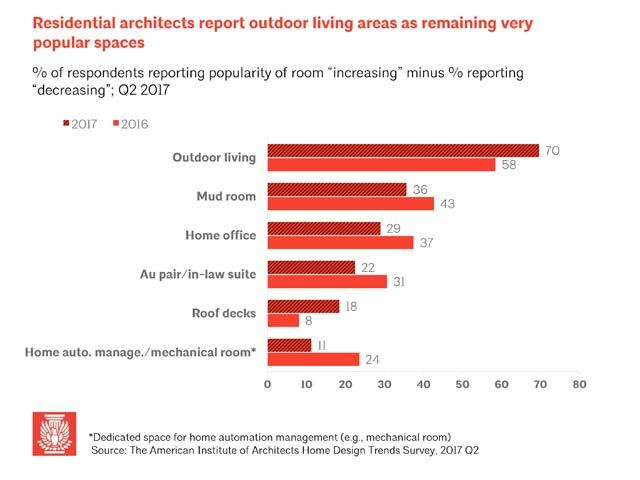 The American Institute of Architects Home Design Trends Survey provides excellent insight into what residential features are most desired by owners and buyers. Every quarter, hundreds of architecture firms provide project data, allowing a clear picture of new and emerging trends to come into focus. This picture is clear – outdoor living space consistently tops the list of what is important to homeowners. Outdoor living space is consistently shown as one of the most desired residential features. While the growth rate fluctuates year to year, its top position of growth in demand dictates that residential designs give consideration to this special function area. 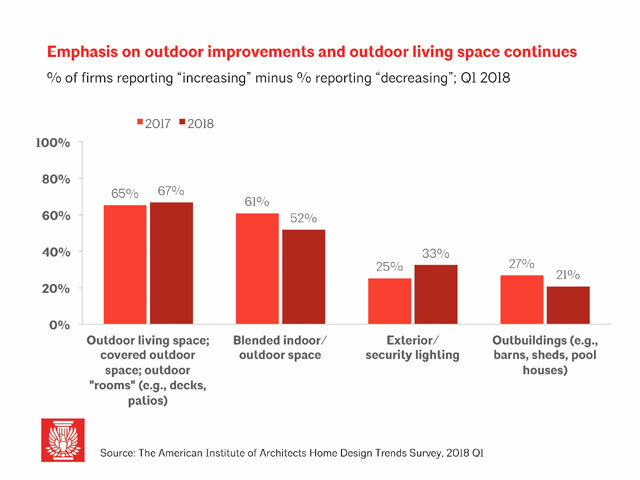 Further, blended indoor/outdoor spaces also rate high on the list. This trend of usable outdoor living space as part of the overall residential lifestyle means creating a harmonious flow with use of space and product choice. A new addition to the list of most in-demand residential features is roof decks. Roof decks made the list as a growth area for special function areas in 2017 and 2018. Perhaps as a direct result of combining the desire for outdoor living space and the blending of indoor and outdoor spaces, roof decks are now a category of their own. While roof decks have traditionally been associated with coastal metropolitan areas, they are now showing up more and more in suburban communities or urban neighborhoods that embrace a healthy lifestyle. The availability of affordable, reliable roof deck waterproofing products makes incorporating roof decks into residential plans an easy way to make designs stand out. Roof decks a luxurious residential feature for homeowners and also allow increased profitability for builders and developers. The ability to offer increased square footage of usable space without increasing the footprint of the home adds significant value. 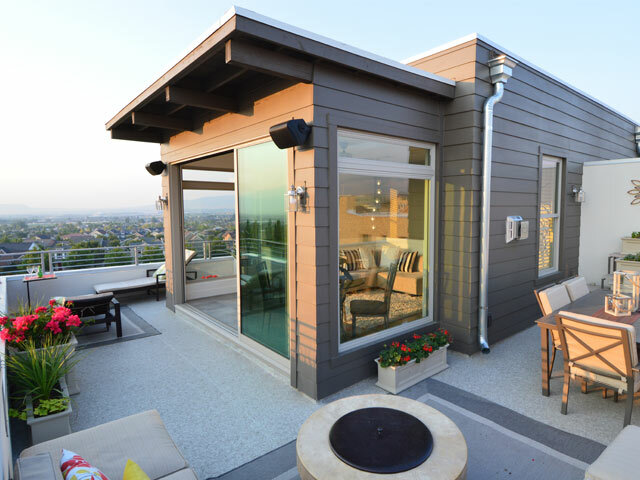 Whether on single-family suburban homes or on multi-residential urban developments, incorporating roof decks allows a higher selling price and increased profitability. Additionally, floor plans that include a roof deck typically sell much faster than their similar counterparts within the same development. Exterior design essentials also include low maintenance advantages. 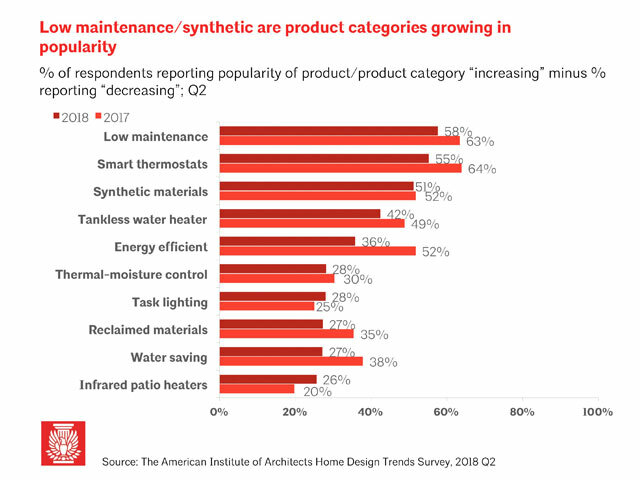 Low maintenance and sustainable building products home products are consistently at the top of the list of in-demand features. Today’s homeowner does not have the time or the desire to spend countless hours on home maintenance. Products that will perform longer, without maintenance, have a higher value than a budget alternative. There is also an added environmental benefit when using Green Building products. Homeowners that want to make a smaller footprint, reduce emissions and save a tree will value low maintenance, sustainable products. Simpler exteriors using fewer materials is also a popular choice. When it comes to decking products, Duradek PVC membranes are an excellent choice for environmentally conscious designers, builders and homeowners. Duradek membranes qualify for Leeds credits, due in part to its longevity of performance combined with overall transportation volume. Additionally, Duradek membranes are applied to un-treated plywood. This provides about double the life expectancy over pressure treated wood. This means long-lasting decks where no harmful chemicals will ever leach into the environment. 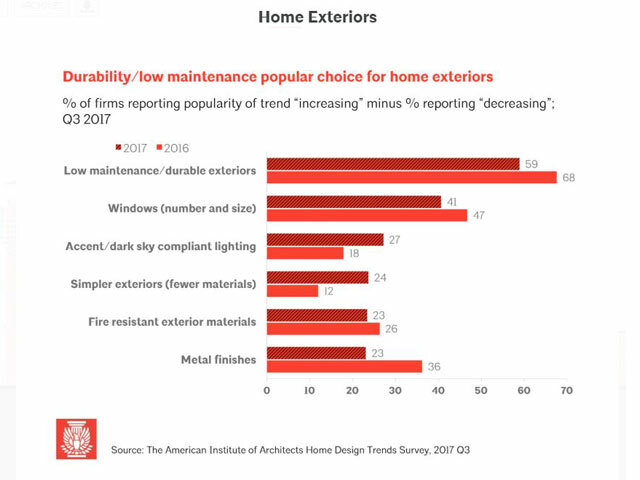 While not specifically identified in the AIA Home Design Trends Survey, use of fire rated building products has become a significant consideration. Particularly with the California wildfire issues in 2017 & 2018, requirements such as WUI (wildlife urban interface compliance) and Class A fire rated products for residential exteriors are important factors. It is good practice to exercise due diligence and verify building product claims to meet these requirements by reviewing testing reports for authentication. Duradek’s PVC membranes are a practical and efficient means of achieving multiple exterior design essentials with a single product solution. They provide waterproof outdoor flooring to satisfy outdoor living space demands. Duradek vinyl comes in an excellent selection of colors and patterns to satisfy the look homeowners want. Duradek is also a classified roofing membrane. It can achieve both a class A and class C fire rating (with recommended assembly). The vinyl sheeting performs throughout its lifetime from a single application and qualifies for LEED credits. Now that you’ve finished the article, earn 1.0 AIA Learning Credits by taking the corresponding continuing education course on AEC Daily, “Walkable PVC Roof Deck Membranes”. Duradek has been installed on over 150 million sq. ft. of decks and flat roof decks all over North America. Contact us for more information or to be put in touch with a Duradek Dealer in your area.